The Handler Jacket is made of durable, wind and water resistant, exterior nylon fabric. It has a soft fleece lining on the interior. The jacket has a full length, front zipper. 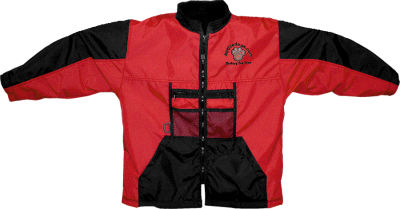 The front has six pockets and a D-ring for your leash. There is a large, 2 part pocket in the back for tugs. The jacket is double seamed and top stitched.